The first pictures of America's new 1,350bhp challenger for the production car speed record have leaked onto the internet. The SSC Ultimate Aero II is the latest hypercar from the team that seized the coveted title from Bugatti back in 2007. Since then the Veyron Super Sport has returned the record to Italy with a 267mph run. The new car was revealed to a select bunch at a private ceremony in California last month, but this picture is taken from a Top Gear magazine photo shoot due to appear in the next issue. The Ultimate Aero II is the work of new Saab Design Director, Jason Castriota. 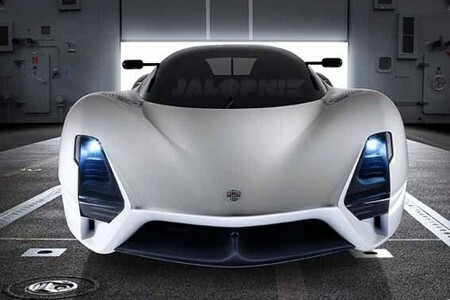 The car pictured is thought to be a full scale mock-up, with the company expecting to have a prototype on the road by the middle of next year. Boss Jarrod Shelby has also promised that the car's exotic design will not get watered down in the transition from model to production road car. No details on the technical specifications of Aero II are yet available, but with the programme dubbed Project280, it isn't hard to see what the American car maker is aiming for.